Last weekend I went home to the Native American Indian Reservation in northern Wisconsin on which I was raised. I always find it so grounding to go home to the “Res” as it is known to the locals. 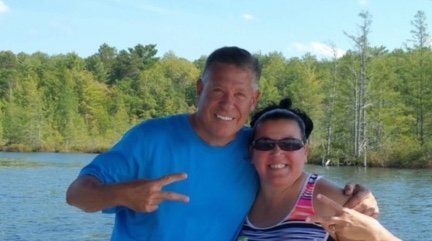 It was especially grounding this trip because I got to spend two and a half peaceful hours with my Chippewa little sister, Melissa Doud, on her new pontoon boat. Although I am not Native American, and not her blood brother, we share kindred spirits and souls, and much family and Native American history, not the least of which was dancing in the “Pow Wows” for the white tourists in the summer. –	She kept forging ahead, trying to stay as active and positive as humanly possible. –	She asked for help, especially from fellow combat veterans, support groups, and therapists. –	She used her children for both emotional anchoring and inspiration, especially recognizing that restoring her state of mental health was essential for her kids’ survival. 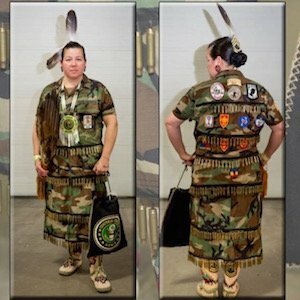 As a special thank you to this special veteran, I implore you to vote for her song “Bullet Dress,” which is up for a Native American Music Award in Category 14. (You can listen to Bullet Dress on Soundcloud.) In the song, she references her Chippewa name, Animikiikwe, pronounced (Ah-nimi-key-kwe), which means “Thunder Woman” or “The Storm is Coming.” Lastly, I encourage you to share this link on your social media sites and ask your friends to vote for her song as well. This entry was posted in Blog and tagged employee engagement on October 12, 2017 by Kevin Sheridan.